In 2016 I was asked by ESPN to design a Concept Cleat for Falcons Wide Receiver, Julio Jones. They asked a handful of apparel designers to start with a blank canvas, and create a cleat design that they felt best reflected their assigned player. Below is my inspiration, and the final cleat concept designs. Julio Jones aka "Jet Jones" is the Atlanta Falcons star Wide Receiver. 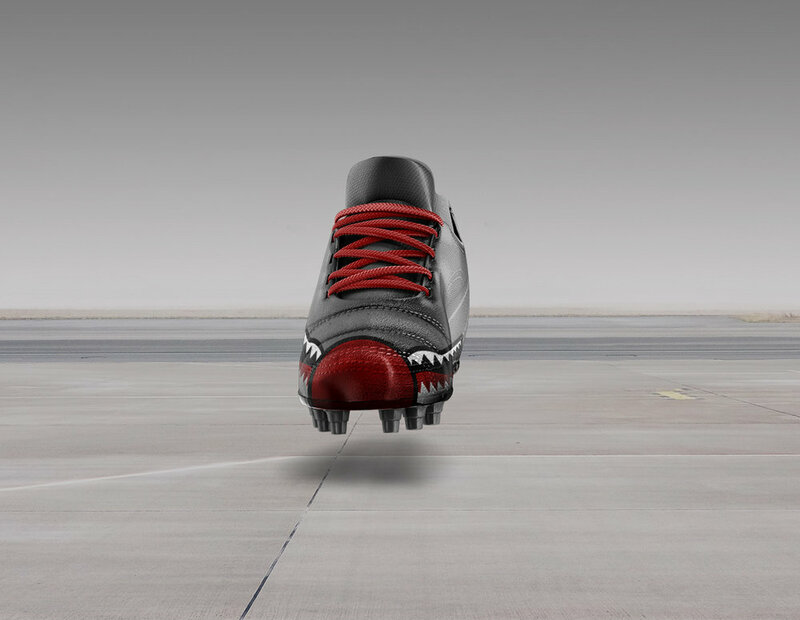 The idea for his cleat was to create a design that featured the essence of a fighter jet, which like Julio is a tough and fast machine. Below are inspirational images that were used in the process of the design. Below are some explorations from my reference images above. I explored different paint job styles from different fighter jets and bombers. These explorations ended up inspiring the final result seen blow. Julio Jones is like a fighter jet waiting to take off, hence his nickname "Jet Jones." I captured that essence with the iconic shark-mouth-themed nose art and the lightning on the tail. It is the perfect representation of the speed, toughness and aggression we see from Julio on the field. And those five footballs near the tail? Those represent his five touchdown catches for the Falcons this season.